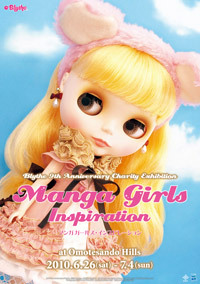 To celebrate Blythe‘s 9th Anniversary in Japan, manga artists and animators have collaborated to create original celebrity dolls that will be exhibited at its Manga Girls Inspiration Charity Exhibition from June 26 to July 4 in Japan. The back of the doll’s head was signed by CLAMP and the doll will be put on auction to raise funds for charity. Thanks for the info!, always happy to read about CLAMP. Well, I find them creepy ._. These dolls are really creepy!!!!! I never got the appeal. Not even now that it’s (supposed to be) Sakura, one of my favorite characters. the eyes are pretty scary looking though. The doll is scary ugly. Point. Sakura is so sweet and cute. 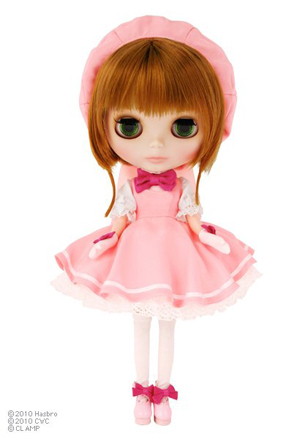 The doll looks bored and alien-like. Mas tenho que confessar que fiquei um pouco desapontada. Tenho uma surpresinha p/ vc! Adivinha? !